It was like whale soup out there today! 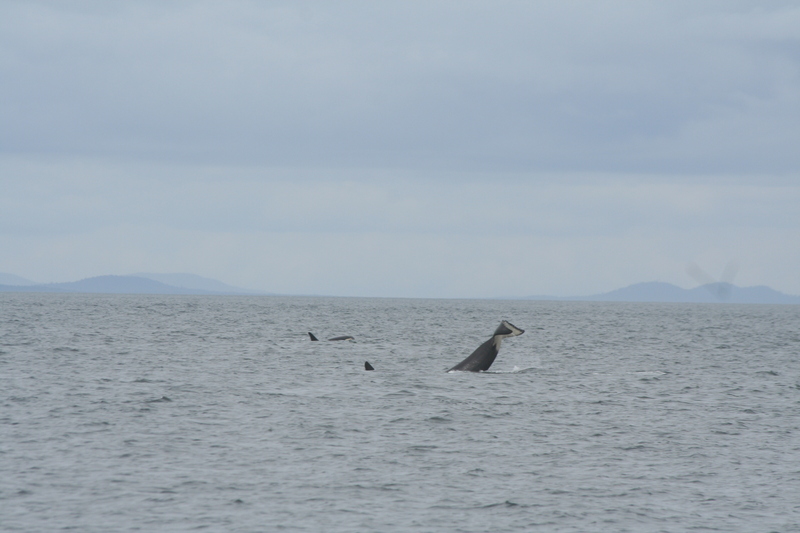 After a quiet period over the last week or so it was encouraging yesterday to hear that the whales had once again returned to the area. 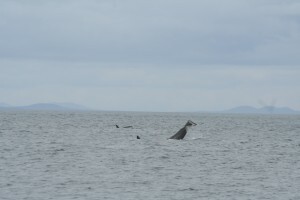 The killer whales were first heard in the early hours from the Lime Kiln hydrophones (http://orcasound.net/), however, as the morning progressed the whales were reported further north. 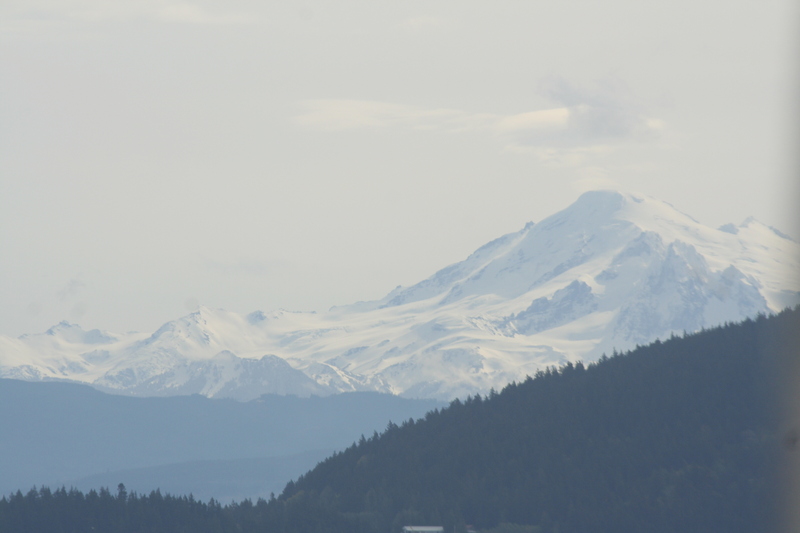 We had our suspicions that they would be heading towards the Fraser river via Active Pass in search of Chinook salmon. Chinook salmon are thought to be the Southern resident’s preferred prey because of their large size and high lipid content. The navigation team responded to the various reports by planning a route to intercept the whales in the Strait of Georgia. Although we were a few hours behind the whales, the Gato finally caught up with the whales by the coal docks at Tsawwassen. The twelve or so whales at the docks were later identified as members of J pod. 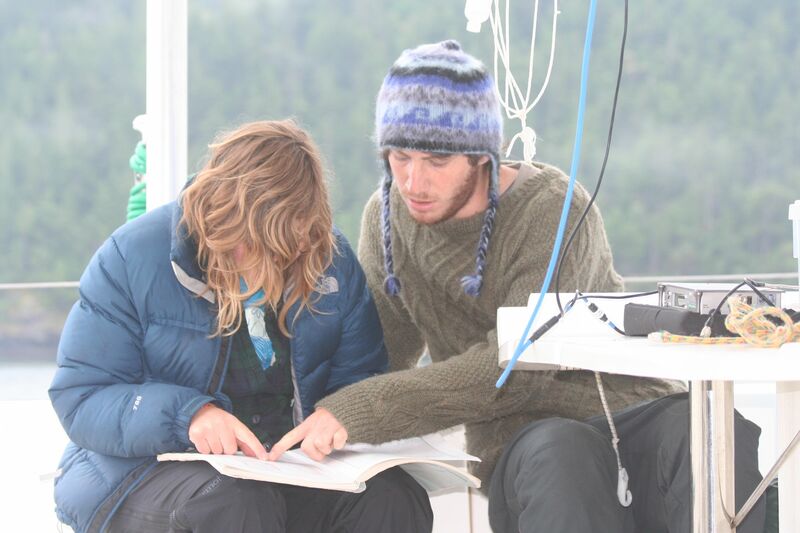 Although the seas were quite rough, we still managed to record over two hours of behavioural data. Unfortunately the whales weren’t vocal, and so little acoustic data was taken. After a great afternoon with the whales we headed to Patos Island for the night. It was the first time that this particular Beam Reach class had moored at Patos. Patos is one of the most northern islands in the San Juans, and is strategically located close to both the Strait of Georgia and Boundary Pass. It was another early(ish) start this morning with the hope of catching up to the whales. Fortunately, the currents and tides were working in our favour. 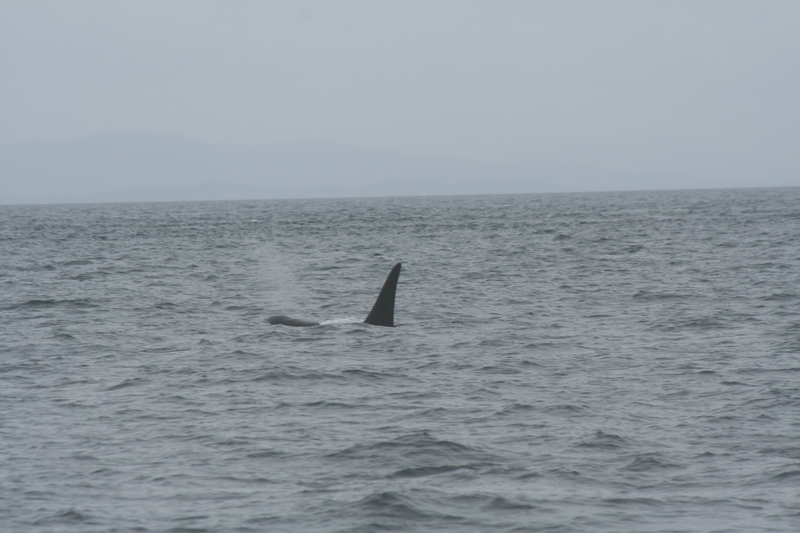 We met the whales between Salmon Bank and Hein Bank (a few miles south west of San Juan Island). There seemed to be a number of groups spread out across the Strait. Whereas the whale watch companies stuck with the ‘main group’ we decided to follow a smaller focal group of a few individuals. This decision paid off because we were able to record some great vocalisations. Over the hydrophone array we heard many S1 calls and clicks. 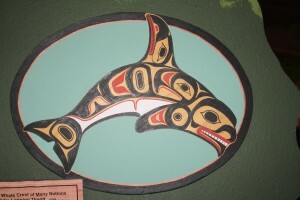 The S1 call is the predominant call type for J pod and suggested to be a contact call. Contact calls are primarily used to establish the location of other pod members during certain behavioural states (Ford and Fisher 1983). Many of our research projects are focusing on S1 calls, and therefore the crew were delighted to hear them over the hydrophones. 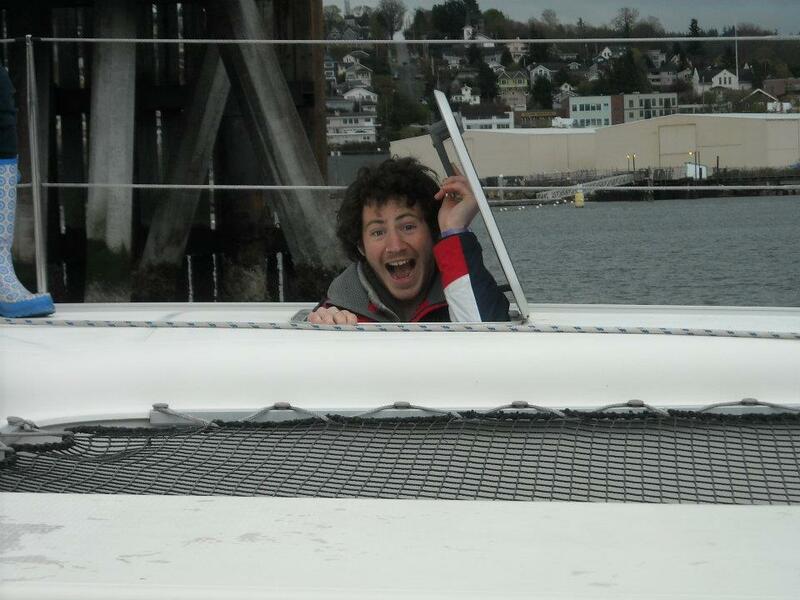 Not only were the whales vocal, they were seen spy hopping and tail slapping around the boat. 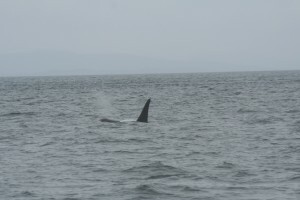 Today was the first time that I had seen an Orca spy hop. I was completely lost for words. We stayed with this particular group for over two hours before riding the flood north back to Snug Harbor. Whales were also encountered as we neared Snug Harbor; these whales were also quite active, and were observed lunging out of the water. Over the last few days, we have recorded some incredible acoustic and behavioural data that we are still in the midst of processing and analyzing. Everyone is pleased that we have finally seen some whales. Hopefully this ‘whale run’ will continue over the next few days. I will keep you posted. We are NOT willing to compromise. After an early start the group finally made it to Bellingham, WA where we met the Gato Verde, and Captain Todd, for the first time. 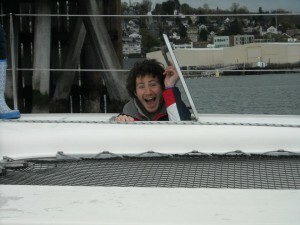 Despite looking through past Beam Reach sailing photographs the “Gato” exceeded my expectations. When I was younger, I would always pester my dad to take me to the harbour to look out at the boats. This time, as I looked out onto the dock, a beautiful 42ft hybrid electric-biodiesel catamaran stared back at me. Our home for the next few weeks, the Gato stood out amongst the other vessels. Never did I imagine that one day the ocean would be my classroom. After having a brief tour of the boat—whilst it was safely fastened to the dock— we began exploring our cabins and bringing fancy science equipment on board. My cabin was particularly quirky because it was positioned at the front of the boat and was accessed by a floor hatch. 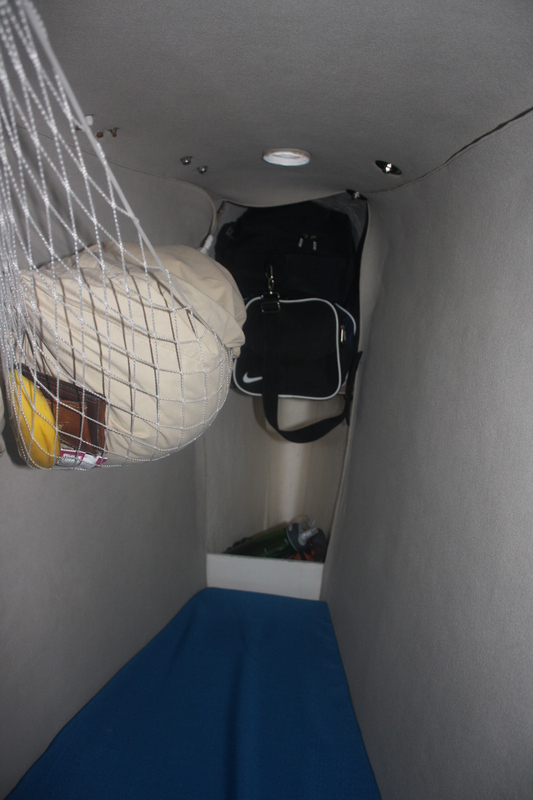 Although it seemed small, on first appearance, there was more than enough space for me to sleep comfortably in addition to housing my luggage (yes, I still haven’t mastered packing lightly). In fact, I felt fortunate that I had one of two single ‘rooms’. Another feature of the boat that I loved was the ‘trampoline’ that spread the breadth of the fore deck. Fortunately, as this was just a ‘practice cruise’, the group found many opportunities to lie on the netting overlooking the water. We were hoping to get some bowriding Dall’s porpoise, but, we had no such luck. This particular four day excursion was intended as a way for us to adjust to life at sea. After a wobbly few hours we soon found our sea legs. Our mornings were structured around a chore schedule, and included tasks such as washing the decks, cleaning the heads, listening to the weather, and figuring out the tide tables. The person assigned ‘navigator for the day’ was required to propose a route to be followed. Another person was appointed ‘science lead’, and was responsible for holding a morning meeting. Our morning meetings enabled us to devise science objectives for the day. Collectively, over the course of the trip, we were able to deploy a variety of science instruments. Such equipment included hydrophones; that allowed us to record ambient noise at Cherry Point (where a coal terminal has been proposed). In addition, we were able to measure for conductivity, temperature, and depth at several sites by deploying a CTD to varying depths. By doing this we were not only discovering the varying physical properties of sea water at different sites, but, also getting experience at handling heavy equipment on board a rocky boat. In addition to these experiments, we were also monitoring our own energy consumption. Daily, we kept records of our water consumption, sewage use, and amount of biodiesel remaining. These are all important factors to consider whilst sailing, especially when practicing sustainable science. In addition to the science, and the log keeping, the group had a sailing lesson with Captain Todd. We learned the names of the various lines, in addition to having a crash course on wind. 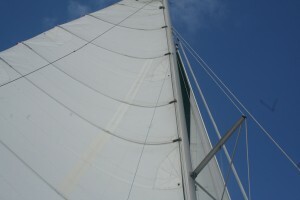 We each took turns at the helm where we attempted to tack. Tacking, or coming about, is a sailing manoeuvre where the bow of the vessel is turned through the ‘eye of the wind’. 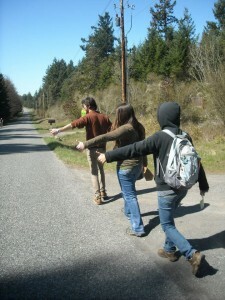 This is commonly done when the desired direction of travel is (nearly) into the wind. In order to tack on something of Gato’s size, it requires good team work and strong communication. I felt the group excelled at this. Fortunately we have been able to spend a large proportion of our time this week outside basking in the Washington sunshine. Although thunderstorms were predicted at the beginning of the week, the forecasts seem like a distant memory. Many hours have been spent this week staring out across Haro Strait in search of the ever elusive whales. We know that they are out there because we can hear them on the hydrophones. A few fortunate folk have even caught glimpses of them as they have passed by nearby inlets (not us). Throughout the San Juans, there is a network of researchers, whale watching boats, and whale heads who keep tabs on the whales and there whereabouts. It is only going to be a matter of time before we see them for ourselves (I can feel it). Today, there were sporadic reports of transients throughout the Strait, and so a few of us decided to try and hitch a ride across the island to Lime Kiln. Hitch hiking is apparently a popular and efficient way to get around the island. In fact, there are designated pick up areas specifically for hitch hikers. It did not take long before the first vehicle stopped for us. On arrival to Lime Kiln we were greeted by an influx of tourists who were making the most of their Easter Weekend. Sadly no whales. We did however spot one river otter foraging in the shallows. We were later joined by other students from FHL (mostly the Zoobot crowd). As we imparted our whale knowledge with the Zoobots, they in turn shared facts about various intertidal invertebrates. Such an interesting crowd! 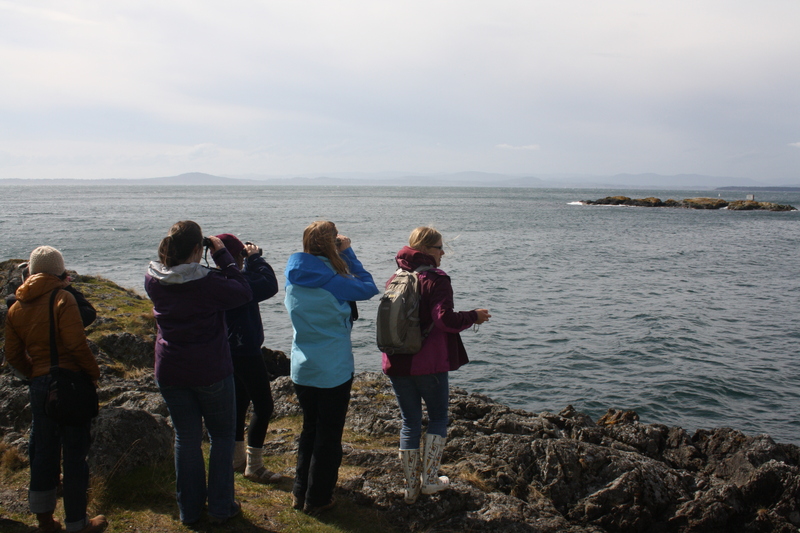 We also explored numerous locations on the south side of the island including Cattle Pass, and South Beach. Cattle Pass is a really unique site where the shallow sea floor forces great quantities of water through a small channel. Thus, the area experiences strong currents which attract an array of sea birds and marine mammals. We were able to test out our birding skills from land-based observations (we still need a bit of work on identifying certain species). Another great reason for visiting Cattle Pass was that it was referenced in one of the papers we were required to read for this week. 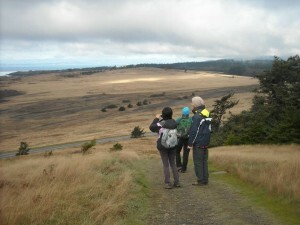 In addition, to get better views (180 degrees) of the surrounding area, we hiked up Mount Finlayson. This got me thinking about how great of a vantage point the hill would be for viewing whales as they swam by. On the evening, we returned to the south side of the island to have a bonfire with some friends. The full moon cast its beautiful hues over the beach and out across the water. Splendid evening! On the academic front, we were given the opportunity to present on a paper that identified bottom-up effects. At a basic level, ‘bottom-up effects’ refers to how the population density of a resource affects the population density of that resources’ consumer. Although most people chose to present on marine-related issues, I wanted to focus on a terrestrial case study. My paper was titled ‘Bottom-Up Effects on Persistence of a Specialist Predator: Ant Invasions & Horned Lizards’. This paper discussed in detail the effects of invasive species on native populations. In my selected case study, a population of coastal horned lizards was being impacted by the introduction of the Argentinean ants to the area. These ants were destroying and out competing the ‘normal’ food source of the lizard. The lizards are ‘sit and wait predators’, and have highly specialized diets. Because of this, they cannot, or are unwilling, to switch to an alternative food source. On reading this, I couldn’t help but notice the similarities between the horned lizards and the SRKW who depend on one species of salmon, the Chinook, despite the abundance of other species in the area. A second paper I discussed this week was titled ‘Management Effectiveness of the World’s Marine Fisheries’. This paper sought to evaluate how management affects fishery sustainability. I was particularly interested to read how sustainability was defined, and also how it was measured. The blend of science and policy made for a good paper. On the topic of good papers, Andrea Buckman and Cara Lachmuth (DFO Scientists) came in to present on their past research. Cara’s presentation on ‘Killer Whale Exposure to Engine Exhausts’ raised some interesting questions, highlighted gaps in existing data, and drew attention to potential areas of future study. The two guest lecturers also sat in on our weekly mentor meetings, offering advice and giving examples of how we can expand on our final research projects. This was greatly appreciated! It seems like the fun never stops! Our first weekend on San Juan Island was fun-filled and packed full of adventure. 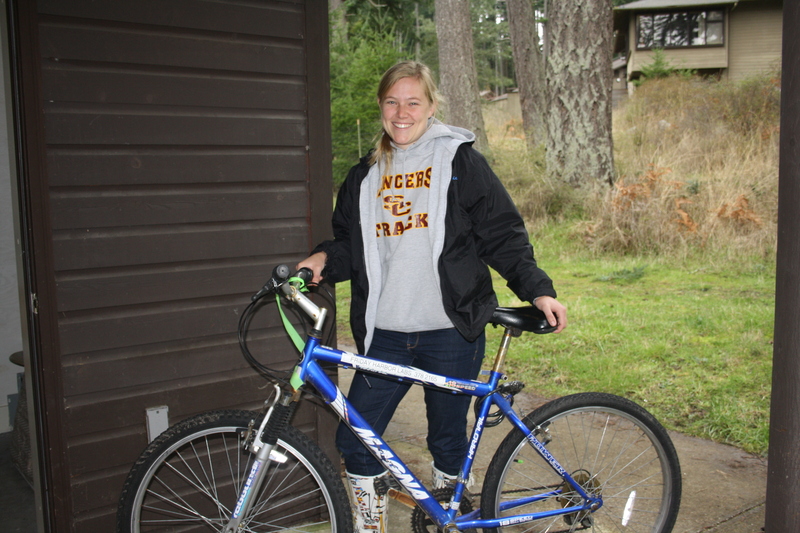 The group decided to stay relatively local and explore the quaint town of Friday Harbor. Friday Harbor, although on first sight may look relatively small, in fact has many stores, parks, and of course a beautiful ocean front waiting to be explored. Because the weather looked promising we decided to take a fifteen minute row into town. This gave us an opportunity to see the island from the water; whetting our appetite for the weeks to come. You get a completely different perspective from being in a little row boat among the larger, and might I add, fancier sail boats. Given our energy and enthusiasm, we headed straight to the whale museum. The Friday Harbor whale museum is dedicated to promoting whale and environmental stewardship through a variety of displays, artifacts, and presentations. What a fantastic resource we have right on our door step. One of my favourite exhibits was the ‘whose your daddy?’ display. I particularly appreciated having a visual of the matrilineal lines within the southern resident community (as genealogy often gets confusing). In addition to visiting the whale museum, we were able to wander around town. I loved discovering a used book shop called ‘Serendipity’ (it certainly lived up to its name). It was like walking in a cave of books—piles of books stacked from floor to ceiling. I could have spent hours looking through the, hundred or so, shelves. Throughout the weekend, I have continued to contemplate the concept of ‘sustainability science’, and the things I can do, in my research, to become a more conscious scientist. In light of this, the class calculated the total amount of energy consumed from five everyday objects. Given we will be living on the Gato Verde in a few weeks, energy consumption is an area we all need to be mindful of. In addition to this exercise, one of the assignments from the latter part of the week provided some food for thought. We were required to find a paper/case study on any topic of interest, as long as it fell within the sustainability science realm. 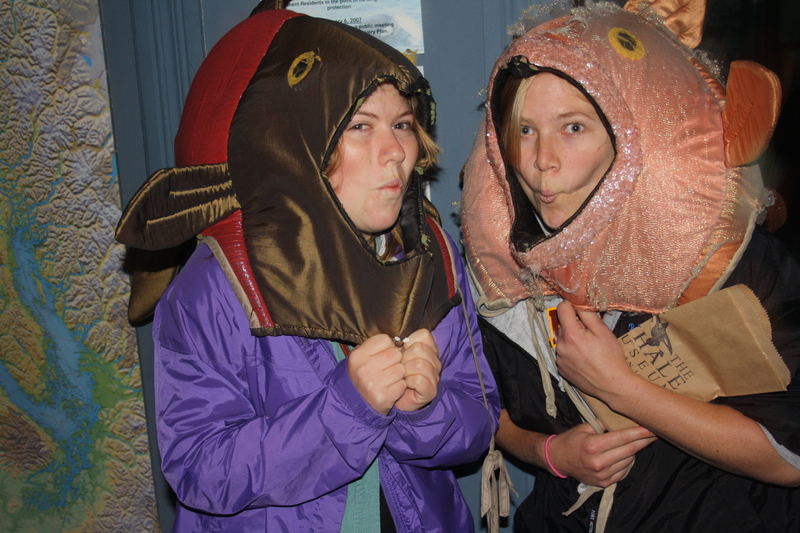 I chose to research fisheries with a focus on community-based management. Last year I took a class on marine policy, and took a particular interest in community-based fisheries management as a way of promoting alternatives to centralized systems. My paper titled ‘The Context of Policy Design for Existing Community-based Fisheries Management Systems in the Pacific Islands’ looked at community-based fisheries management in a number of small Pacific Islands including Papua New Guinea, Vanuatu, and the Solomon Islands. My paper was very informative in terms of providing the reader with a good overview of national policy and highlighting some of the obstacles associated with implementing such a system. However, because the paper lacked data, it was challenging to analyze existing management schemes in relation to population trends of various species. If I was to continue with this project I would make every effort to collect data to be used as evidence to support this alternative approach to fisheries management. One thing I will take away from the paper is that there is a need for interdisciplinary research that combines human ecological, biological, and economic approaches. Interestingly, Bre’s paper also chose to focus on community-based management (this time regarding forestry in Nepal). Many parallels could be drawn between both our papers. On a separate note we, as a group, have started to create our own data sheets for the research to be conducted at Lime Kiln. Over the next few weeks, we are going to be looking specifically at marine mammal, sea bird, and vessel abundance (and behaviour). Although the proposed data sheets are still in draft form, we are confident that they cover an array of potential observations. 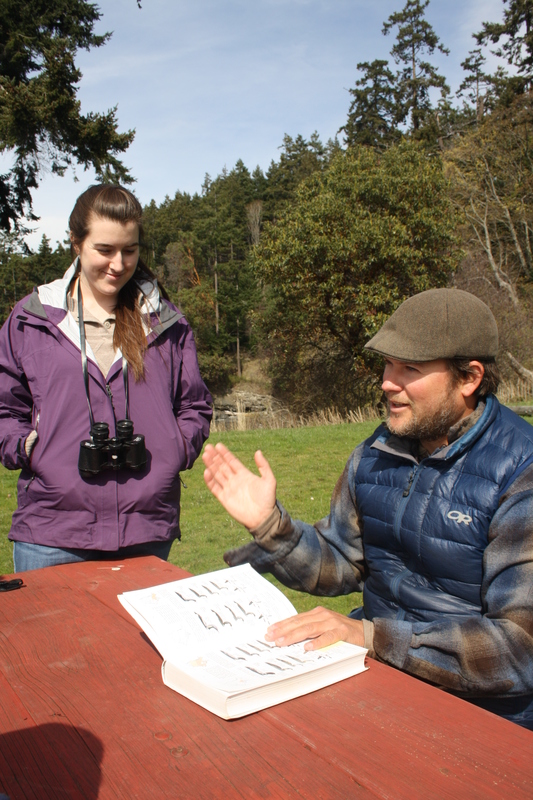 In preparation, we had a ‘birding lesson’ today with Jason Gunter. Despite the windy conditions, we were fortunate enough to see many Bald Eagles, in addition to a few Oyster Catchers, and the odd Cormorant. After an amazing two weeks Spring break travelling from coast to coast, I have finally made it to the idyllic Friday Harbor Labs in the San Juan Islands. It is difficult to give the place justice through words alone. I feel so fortunate to be living for the next ten weeks in a place where tiny evergreen islands litter the sea and snow capped mountains touch the lapping waters. How can anyone be expected to study in such a gorgeous environment full of distraction? I feel I constantly want to be outside exploring! In some respects the area reminds me of Maine, however, on a more dramatic scale. Since meeting the other Beam Reachers, in Seattle little under a week ago, we have embarked on numerous adventures together. It is so great to be surrounded by like-minded students who share a passion for conservation and the environment. If you wander past the ‘S1 duplex’, regardless of time of day, one can expect to hear music playing and the sounds of laughter in the air. Yes, there has been lots of laughter! It has also been great integrating with the other students and researchers at the lab. Hearing about their work, I would argue that the quality and diversity of the research generated at the lab is astonishing. Rachel: Lots of exploring to do! Did I mention loads of laughter? As a class, it feels that we have already learnt so much; way more than I could have envisioned at the start of the week. So far, we have covered basic whale biology, killer whale family structure, population trends, and even dipped in to whale genealogy. In addition to the marine mammal component of this ten week intensive course, we are also learning the methods of practicing sustainability science. But what does this involve? After numerous discussions, both inside and outside of the class room, it has become evident that the scope of ‘sustainability science’ is broad, and the definition specific to each individual. Throughout the week, having grappled with some case studies and current literature, I have found my own personal definition to have evolved. At the moment, I would describe it as an interdisciplinary approach to science that takes into consideration local and global perspectives, whilst remaining conscious of environmental, social and economic factors. Through innovation, education, and the evaluation of current practices we can both mitigate and minimize our footprint on both a regional and global scale. Because this is still a working definition, my hope is to revisit and reference it throughout the quarter. I would encourage any readers to pause for a moment and think of their own definition. I would also like to draw the reader’s attention to RE-sources; a local organization run from Belligham, WA. (http://www.re-sources.org/home). Katie Fleming, a RE-source community outreach manager, came in to draw our attention to local sustainability science issues, and the things we [students] can do to get involved. I was particularly impressed by the examples she gave that highlighted various methods, such as workshops and citizen training, used by RE-source to empower local communities. Hearing the perspectives of an outside source has been insightful. In addition to Katie Fleming, Lynne Barre from NOAA came in to give an overview of Southern Resident Recovery. Given the success of the first week, I can’t wait to find out what next week has in store for us!